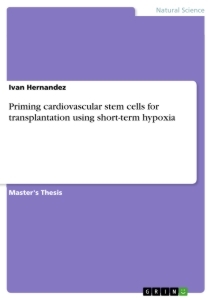 The discovery, isolation, and culturing of human embryonic stem cells has been described as one of the most significant breakthroughs in biomedicine of the century.1 This promising area of science has led scientists to investigate the possibility of cell-based therapies to treat disease, which is often referred to as regenerative or reparative medicine . Stem cells give rise to the multiple specialized cell types that make up the heart, lung, skin, and other tissues and offer the possibility of a renewable source of replacement cells and tissues to treat diseases including Parkinson's and Alzheimer's diseases2, spinal cord injury, stroke, burns, heart disease, diabetes, osteoarthritis, rheumatoid arthritis, etc. 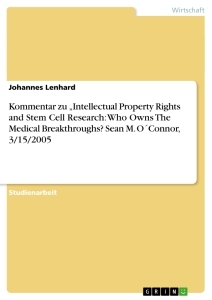 The Stem Cell Research (SCR) has become the centre of public attention, both as a fascinating area of biomedical research and as a permanent focus for ethical and legal controversy.3 The controversy is not because of its goals, but rather because of the means of obtaining cells. The crux of the debate centres on derivation of embryonic stem cells which require the destruction of an embryo. Stem cells have two important characteristics that distinguish them from other types of cells. First, they are unspecialized cells that renew themselves for long periods through cell division. The second is that under certain physiologic conditions, they can be induced to become cells with special functions such as the beating cells of the heart muscle or the insulin-producing cells of the pancreas. Scientists primarily work with two kinds of stem cells: embryonic and adult stem cells of animals and humans . Scientists discovered ways to obtain or derive stem cells from early mouse embryos more than 20 years ago. Many years of detailed study of the biology of mouse stem cells led to the discovery of how to isolate stem cells from human embryos and grow the cells in the laboratory in 1998.4 The embryos used here were created for infertility purposes through in vitro fertilization5 procedures and when they were no longer needed for that purpose, they were donated for research with the informed consent of the donor. 1.1 What are embryonic stem cells? 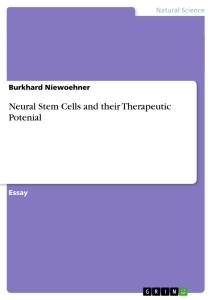 1.2 What are adult stem cells? An adult stem cell is an undifferentiated cell found among differentiated cells in a tissue or organ, can renew itself, and can differentiate to yield the major specialized cell types of the tissue or organ. Some scientists use the term somatic stem cell instead of adult stem cell. The primary roles of adult stem cells in a living organism are to maintain and repair the tissue in which they are found. They are a very small number of stem cells in each tissue. They reside in a specific area of each tissue where they may remain quiescent (non-dividing) for many years until they are activated by disease or tissue injury. The history of research on adult stem cells began about 40 years ago. In the 1960s, researchers discovered that the bone marrow contains at least two kinds of stem cells. One population, called hematopoietic stem cells, forms all the types of blood cells in the body. A second population, called bone marrow stromal cells, was discovered a few years later. In 1990s scientists discovered that the adult brain does contain stem cells that are able to generate the brain's three major cell types— astrocytes and oligodendrocytes, which are non- neuronal cells, and neurons, or nerve cells. A number of experiments over the last several years have raised the possibility that stem cells from one tissue ma]y be able to give rise to cell types of a completely different tissue, a phenomenon known as plasticity. Examples of such plasticity include blood cells becoming neurons, liver cells that can be made to produce insulin, and hematopoietic stem cells that can develop into heart muscle. Therefore, exploring the possibility of using adult stem cells for cell-based therapies has become a very active area of investigation by researchers. - Researchers at Harvard Medical School say adult stem cells may eliminate the need for embryonic ones. The researchers experienced a permanent reversal of Type 1 diabetes in mice by killing the cells responsible for the diabetes. The animals’ adult stem cells took over and regenerated missing cells needed to produce insulin and eliminate the disease. The results hold promise for rheumatoid arthritis, multiple sclerosis, lupus and more than 50 other ailments. - At the University of Texas MD Anderson Cancer Center in Houston, a man with a rare, potentially fatal skin disorder that was so severe that he could no longer eat, is now symptom-free after receiving a transplant of his own adult stem cells. - Doctors at Northwestern Memorial Hospital in Chicago extracted the adult stem cells from the blood of two Crohn’s patients and successfully used them to rebuild their faulty immune systems. - Researchers at the University of South Florida in Tampa have found that adult stem cells from the umbilical cord blood may be able to help repair damaged brain tissue after a stroke. - Dr. Edward Holland of the Northern Kentucky Eye Laser Center in the greater Cincinnati metropolitan area, is using adult stem cell transplants as part of a treatment to dramatically improve the eyesight of his patients. - The Albert Einstein College of Medicine in New York came to similar conclusions. A study by the Institute for Stem Cell Research in Milan, Italy showed that certain cells from the brains of adult rats can be used to generate muscular tissue. - Scientists at the University of Medicine and Dentistry of NJ have found that bone marrow cells may be converted into replacement nerve cells, able to treat brain and nerve injuries. Dr. Ira Black and his team were able to convert 80% of the bone marrow cells into nerve cells. 1 See Thomas B. Okarma, “Human Embryonic Stem cells: A Primer on the Technology and Its Medical Applications,” in The Human Embryonic Stem Cell Debate, S. Holland, et.al. eds. (Cambridge: MIT Press, 2001). 2 Parkinson's disease (PD) is a very common neurodegenerative disorder that affects more than 2% of the population over 65 years of age. PD is caused by a progressive degeneration and loss of dopamine (DA)- producing neurons, which leads to tremor, rigidity, and hypokinesia (abnormally decreased mobility). PD may be the first disease to be amenable to treatment using stem cell transplantation. Alzheimer's disease constitutes about two thirds of cases of dementia overall (ranging in various studies from 42 to 81 percent of all dementias). Alzheimer's disease is a progressive neurologic disease that results in the irreversible loss of neurons, particularly in the cortex and hippocampus. The clinical hallmarks are progressive impairment in memory, judgment, decision making, orientation to physical surroundings, and language. 3 See LeRoy Walters, “Human Embryonic Stem Cell Research: An Intercultural Perspective,” Kennedy Institute of Ethics Journal 14/1 (March 2004): 3. 4 By a team led by Dr. James Thomson at the University of Wisconsin. 5 In 1978 in vitro fertilization (IVF) led to the first successful human birth. 6 Blastocyst is a preimplantation embryo of about 150 cells produced by cell division following fertilization. The blastocyst is a sphere made up of an outer layer of cells (the trophoblast), a fluid-filled cavity (the blastocoel), and a cluster of cells on the interior (the inner cell mass). Trophoblast is the extraembryonic tissue responsible for implantation, developing into the placenta, and controlling the exchange of oxygen and metabolites between mother and embryo. The fluid-filled cavity inside the blastocyst of the developing embryo. Inner cell mass (ICM) is the cluster of cells inside the blastocyst. These cells give rise to the embryo and ultimately the foetus. The ICM cells are used to generate embryonic stem cells. 7 Totipotent means “capable of becoming anything”. 8 Pluripotent stem cells can give rise to any type of cell in the body except those needed to develop a foetus. 9 Multipotent stem cells can give rise to a small number of different cell types. 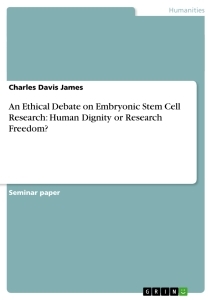 10 Cited in Bradley Mattes, “Embryonic Versus Adult Stem Cells? It’s Really No Contest.” http://www.lifeissues.org/cloningstemcell/bradsarticle.html. Cf. 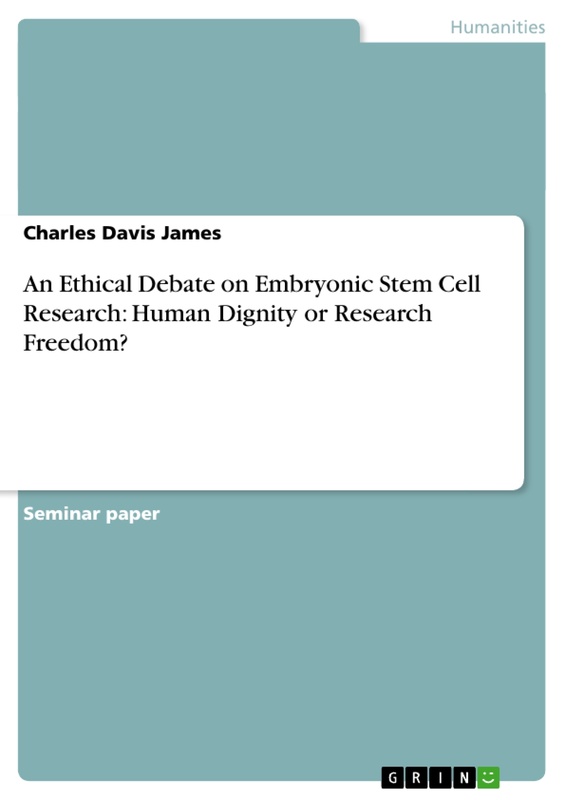 AAAS Policy Brief: Stem Cell Research. Updated December 14, 2007. http://www.aaas.org/spp/cstc/briefs/stemcells/. Accessed on 31.05.08. The paper is worthy of publication. It has been published in Jnanadeepa: Pune Journal of Religious Studies, India. Murder on behalf of science?